How many different ways could we get to Alpha Centauri Bb, and how long would it take? “Bb.” “Bb.” Where do we come up with this stuff? Alpha Centauri is a binary star system, like many in our galaxy, and to distinguish between the two stars we assign them capitol ‘A’ and ‘B’. These denote the larger and smaller stars in a double star system respectively. Alpha Centauri ‘B’ is therefore the smallest of the binary pair. At their closest approach they are separated by just 11.2 AU, similar to the distance between the Sun and Saturn, and at their furthest they stretch out to the orbit of Pluto at around 36 AU. This system, however, is special. 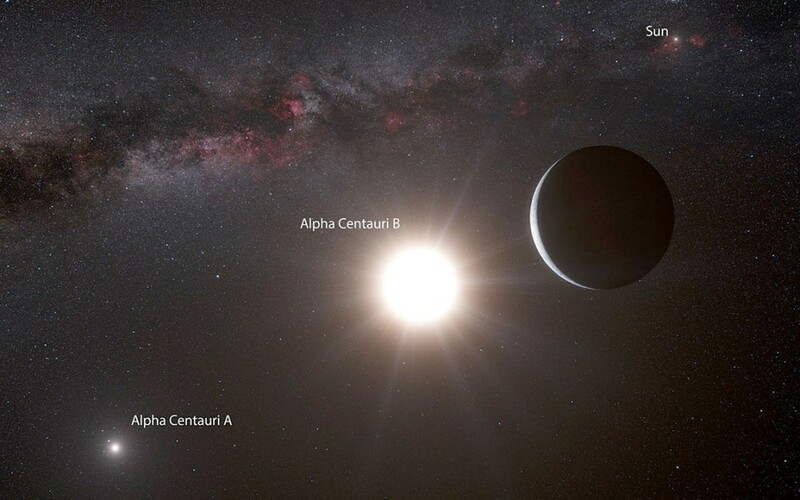 Not only is Alpha Centauri AB the closest star system to our own, it is also the closest planetary system as well. In November this year an article was published in Nature reporting the discovery of an Earth-mass planet orbiting Alpha Centauri B. Alpha Centauri Bb, or α Cen Bb, was discovered using the radial velocity method to be 1.13 times the mass of the Earth in an orbit of just 3.5 days orbiting its star at a distance similar to that of Mercury. The exoplanet community has adopted a lowercase ‘b’ to name the ever-growing population of planets in our galaxy, and hence the slightly awkward names. So as Alpha Centauri is the closest planetary system to us, and although the planet would sadly not be habitable, what would it take to get there? The system is a meager 4.09 light years away; that means that it takes the light leaving the star 4.09 years to reach us here on Earth. Therefore if we were able to travel at the speed of light in just over 4 years we could be vacationing on a not so comfortably warm world. But most of us drive or take a plane to get to our holiday destinations. How long would it take then? If we were to drive in a car at an average of 60 mph traffic permitting and without having to stop for gas in just 46 million years we could be there. That is almost as long since the dinosaurs were wiped out. What about a plane then, a Boeing 747 has a cruising speed of 570 mph cutting your travel time down to just 5 million years only twice the time it took our genus, Homo, to evolve on the Earth. Let’s be more realistic now, what about a rocket how fast could that make us go? Conventional rockets are funnily enough designed to go only as far as they need to and that then dictates the speed at which they travel to get there. Perhaps the easiest destination from the earth would be to the International Space Station in low Earth orbit. To get there you would need a rocket that travels at a minimum of 17,000 mph, although this would bring your trip to Alpha Centauri down to a more imaginable 170,000 years we are still not quite within the realms of the plausible. What we really want to know is what it would take to leave the solar system and the gravitational grasp of the Sun. For that we require more fuel, the only problem is that with more fuel comes more mass and this does not follow a nice smooth relationship. The more mass we add soon out ways the effect it has on the speeds we can reach and the reasonable distances we can then travel. A solar escape rocket like those used for the Voyager missions needs to be travelling at over 36,000 mph. Voyager 1 and 2 were launched in the 70’s and have barely made a dent in the 10 trillion miles to Alpha Centauri, negating the fact that they would have to stop on the way and ask for directions. Though Voyager 1 and 2 are among the fastest manmade objects we have launched out into the solar system another type satellite has gravity on its side and beats them hands down. Helios II currently holds the tile of ‘fastest man-made object’ traveling at an astounding 160,000 mph; that means that in one hour it could circumnavigate the Earth six and a half times. 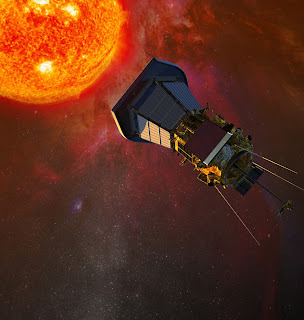 This, however, will be surpassed by another solar probe, which will reach speeds of 200 km/s with the help of the Suns gravitational pull, that’s nearly 450,000 mph, and is brilliantly named Solar Probe Plus. At this speed it would only take 6,400 years to reach Alpha Centauri an admittedly enormous stretch of time but significantly smaller than the 46 million years we started off with. In all honesty the most realistic speed we would need to accomplish in order to make it to the system within a lifetime of a standard space crew would be one-tenth the speed of light. Light can travel 300 million meters in one second one-tenth of this is the equivalent of 68 million miles per hour, over 150 times the speed of Solar Probe+. At that speed we would get there in just 40 years and a mission to Mars will look like a walk in the park. Alpha Centauri Bb is just the closest in a myriad of stellar systems out there to explore. So get on it engineers and build us a ship we have places to go a planets to see. I like this analysis. Have often wondered how fast we could "possibly" get to Alpha Centauri, and never taken the time to work it out. 6000 years is much more comprehensible than 4 light years or even the "imaginable" 170,000 years. Nevertheless, it's still a bit too long and the sooner we can bend Time-Space, the sooner we can get there!